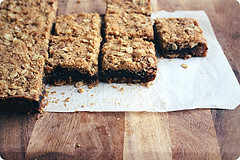 Date Squares recipe. Combination of stoned dates sandwiched between layers of buttery chewy oatmeal crust. Put dates, sugar and water in a saucepan and bring to boil. Simmer over low heat till soft and paste-like. Put flour in a mixing bowl. Rub margarine into it and add brown sugar. Mix well till crumbly. In a lightly greased baking tray, spread flour mixture evenly. Press half the amount of oats into it lightly. See Customer Reviews and Compare Bakeware sets . Spread stewed dated evenly on it, then cover with remaining half of oats mixture. Press down firmly. Glaze top with beaten eggs. Bake in a preheated oven at 350°F for 40 mins. or till golden brown. Remove from oven. Cool, cut into squares and serve.